Newly minted b’not mitzvah celebrate at the top of Masada alongside Rabbi Moshe Elbaz. In a shady alcove atop Masada, in what was once the courtyard of a Roman home, 10 women with garlands of white flowers adorning their heads huddled under a tallit and put their arms around one another. As the desert sun streamed through a crack in the ancient sand wall, they sang “Mi shebeirach,” a prayer for healing, and a few began to cry. “Every song that we sang, every time we held hands, just looking into the radiant faces of the other women … they just looked to me like angels. It meant so much to them. 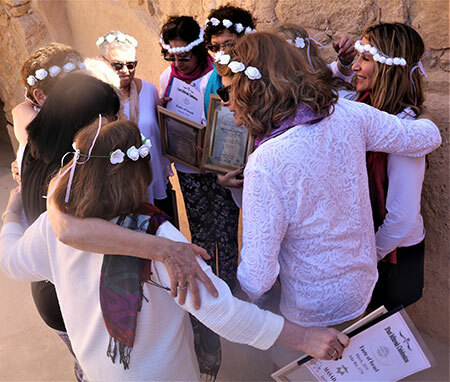 Their hearts were so full,” said Mary Lenhardt of Manchester-by-the-Sea, who shared this transcendent moment with the other eight women who became b’not mitzvah on top of Masada as part of an 11-day trip to Israel in March. Trip leader Rachel Jacobson – the 10th woman in the group hug atop Masada – conceived of the idea after speaking to many women who never had the opportunity to have bat mitzvah ceremonies when they were teens. North Shore women celebrated their bat mitzvahs on Masada. When Jacobson – who was born in Israel and settled in Swampscott – raised the idea during a pre-trip class, some were hesitant, thinking they would need to devote hours of preparation. However, Jacobson and her brother, Rabbi Moshe Elbaz of Temple Israel in Valdosta, Ga., crafted a service full of songs and prayers in Hebrew and English that ensured everyone would be able to participate. Husbands, siblings, friends, and even crowds of tourists watched in awed silence as the group sang Jewish classics like “Hine Ma Tov,” “David Melech Yisrael,” and the “Shehecheyanu,” a prayer that celebrates new beginnings. Roberta Soltz of Salem read a prayer for Israel, while Gail Elkin Goldberg of Marblehead read the story of Purim, Paula Dunn of Bourne and Adele Kirby of Peabody sang the Shema, and Nanci King of Salem sang the Aleinu. Their voices echoed as they looked out at the sun setting over the desert. The majestic, symbolic setting high on a mountain added to the experience. Almost 2,000 years ago, after the Romans destroyed the Second Temple and banished the Jews from the land of Israel, a band of Jews inside Masada’s walls held off the Roman Army for months. They committed suicide rather than become slaves just before the Romans breached the fortress. For the women on the trip, becoming a bat mitzvah in a holy setting reaffirmed and validated their commitments to both Judaism and the land of Israel. The 11-day tour took the group from the far north – a winery near the Golan Heights – all the way south to Beersheba and Arad in the Negev desert. In Jerusalem, they visited the Western Wall, the Knesset, the Israel Museum, Mount Scopus, and Yad Vashem. The group toured Tel Aviv, Haifa, Acre, Caesarea along the coast and stayed overnight at a kibbutz near the Sea of Galilee. They even got to visit Sderot, a town near the Gaza Strip that is an all too frequent target of Hamas rocket attacks. Right after celebrating their b’not mitzvah, the group kicked back – literally – in the Dead Sea. Many of the attendees had never been to Israel before, and some, like Kupersmith and King, hadn’t visited in decades. King and Kupersmith were impressed by the progress the country had made since their last visits.  “It’s grown by leaps and bounds,” said Kupersmith. “To me, it seemed like a much more advanced, progressive, and prosperous country from when I was there 45 years ago,” said King. Spending 11 days together capped off by a meaningful spiritual experience resulted in a powerful bond. “We bonded like cooling Jell-O,” said Goldberg.